Before you try a few organic recipes for pet treats, keep a few things in mind. Dietary requirements vary from one pet variety to another. When you choose a recipe, either make sure it's tailored for the type of pet you'll be feeding, or be clear about what you can add or change safely. Animals don't thrive on the same diet as humans. There are many people foods, like macadamia nuts, raisins, onions and avocados that are poisonous to some common household pets. Indulgences like chocolate and grapes are easy to mistake for good pet snacks, but they're harmful to dogs and can cause problems with other pets too. Before you try a recipe, review the ASPCA's list of poisonous foods. You'll discover that some recipes you come across on the Internet may predate new information about pet safety, like recipes using raisins in dog biscuits. Be an informed consumer and only use treat ingredients that are safe and healthy. You can convert standard pet treat recipes into their organic equivalents by using organic ingredients. Common pet treat staples, like whole-wheat flour, peanut butter and oil are all available through organic suppliers. When you buy organic ingredients, you are purchasing a product that has been made without synthetic fertilizers or pesticides. You are also supporting agricultural methods that are more earth and animal friendly. Check product labels for the USDA certified organic seal wherever you shop. Dogs are omnivores and their diets can easily include a combination of grains, vegetables and quality proteins. When looking for tasty dog-treat recipes, choose those with a good balance of ingredients. Always feed treats sparingly and make them part of a nutritionally balanced diet. 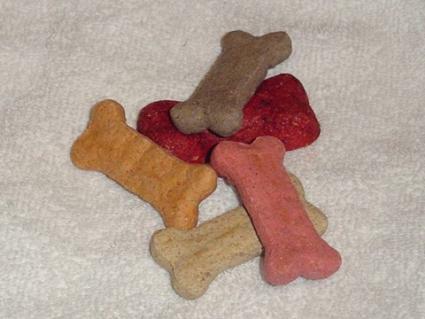 You can use treats to help maintain your dog's health too. Treats that include Brewer's yeast will help repel fleas, while adding a few peppermint or spearmint leaves to a biscuit recipe can sweeten your dog's breath; and baked, firm biscuits will help to maintain your dog's oral health by helping to remove plaque and tartar. Unlike dogs, cats are carnivores and need lots of protein in their diet. If you've had your cat for a while, you probably know what kind of protein he particularly likes and can choose a recipe that will be tailored to his tastes. Cheese, egg, liver, heart, tuna and turkey all make tasty cat snacks, and chances are that one of those ingredients will have kitty begging for more.Just remember that house bound cats often don't get as much exercise as they should, so make treat time part of a balanced diet and don't over do it. After a quick perusal of cat treat recipes, you'll discover that catnip is a popular ingredient. Organic catnip may be hard to find, but it's very easy to grow either in the garden or on a sunny windowsill. If you think of your pet as part of the family, making up a few organic recipes for pet treats every once in a while is a great way to show your appreciation for his loyalty and companionship. The right treats in moderation can be part of a balanced diet that will help your pet stay fit and healthy, and making them yourself can be a fun and rewarding activity. If you have friends who are pet owners, suggest a pet-treat swap, like a cookie swap but with pet treats instead. It's a great way to acquire a variety of organic pet treats and stay in touch with your pet loving pals too.